New Delhi, April 14: Indian members of Team Stark left Robert Downey Jr aka Iron Man overwhelmed by their love and adulation when they assembled in Delhi, Mumbai, Chennai and Bengaluru to meet their favourite superhero early Sunday morning. 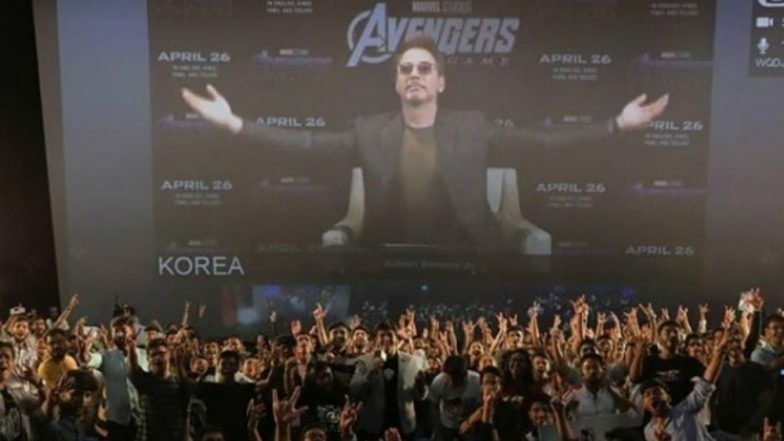 Downey Jr, who has been playing the much-loved character since 2008, was in live conversation with his Indian fans from Seoul. He is currently promoting "Avengers: Endgame" in South Korea with co-stars Brie Larson, Jeremy Renner and directors Anthony and Joe Russo. Only four lucky Marvel fanatics got the golden opportunity to ask a question to their beloved superhero and the actor was all ears to them. When one of the fans asked if he could tell some fun stories from the "Endgame'" wrap party, the actor gave an emotional response saying the film sums up all the good memories the team shared over the years.